There are many things in the Warhammer 40K Rulebook which often overlooked or simply forgotten, but they can make a big difference to your games of Warhammer 40K. After coming across quite a few of these rules over the past few months, I've decided to flip through the rulebook and pick out the important things that many people may have failed to notice, which could help to turn defeat into victory by outplaying your opponent. If you haven't already bought Assault on Black Reach for the models, you should certainly buy it for the Mini Warhammer 40K Rulebook which comes inside it. Not only does it house the Warhammer 40K rules in their entirety, it makes them easy to read, easy to flip through and to carry about your person. 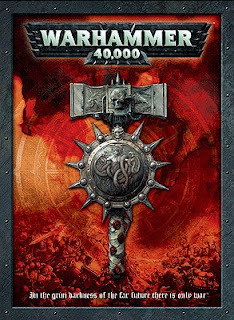 I wish Games Workshop sold the Mini Warhammer 40K Rulebook in stores as an alternative to the massive hardback Warhammer 40K Rulebook. Jump infantry can use their jump packs to move 12" in the Movement phase. This is optional and they may choose to move as normal infantry if they wish. Note: The same goes for Jet Packs. Both units can choose to move as normal infantry if they wish during the Movement phase. Bikes and Jetbikes may not Turbo Boost through difficult terrain and must move at least 18". when a unit disembarks each model is deployed within 2" of an access point and in unit coherency. 'within 2 inches' is a bit of a strange term to describe what is effectively 'within 3 or 4 inches'. If you look at the diagram you can see that the Space Marine with missile launcher has a 2" gap between his base and the access point of the Rhino. He is technically 'within' 2" of the tank, but this does not mean that his base it entirely within 2". This means that models gain an extra inch from disembarking while models on larger bases gain 2". So watch out for those Ork Meganobz and Space Marine Terminators disembarking and charging! Note: If the vehicle has not moved the squad may disembark and move normally. The disembarked may then shoot (counting as moving) and may ASSAULT as normal. A fast vehicle moving 'flat out' moves between 12" and 18"
It is only skimmers which can move 'flat out' between 12" and 24"
Only certaing troops are capable of moving to the upper lels of ruins. Note: These include infantry, jump infantry, jetbikes, monstrous creatures and walkrs - and only if the units can be physically placed there without falling off. Other units may only move on the ground level of the ruin. at least 50% of the FACING of the vehicle which is being targeted needs to be hidden by terrain to get a cover save. Note: This does not mean 50% of the entire tank, just 50% of the facing. Vehicles do not get an obscured save for being inside area terrain. Note: If your unit fires at the only visible facing of a vehicle which is not the nearest facing, then to 'represent the extremely angled shot' as Games Workshop puts it, the vehicle receives a 3+ cover save. There are lots of little rules scattered throughout the book that let you do sneaky things, clever tactics and get special benefits for certain situations. In the case of monstrous creatures, it's important to know that they don't get a cover save unless they are obscured in the same way that vehicles are. No more sitting in sparse woods for Mr Carnifex! I also had fun recently by disembarking a squad of Tau Firewarriors in the 2nd level of a ruined building. My opponent's Space Marine bike squad came roaring up, ready to charge...until I showed him page 83 of the rule book. Suddenly his Ravenwing army didn't seem so deadly in close combat as my Tau occupied all the buildings and were on the second storey. To make sure you never miss a trick, read the rulebook cover to cover and make a note of anything you find interesting and the page number. There's nothing worse than knowing a rule which could stop your opponent dead in his tracks but you can't actually find it in the book! Great list! One rule I was sad to read was that Tau Jetpack equipped units cannot move in the assault phase if they deep strike....but that's in their codex! Brilliant - nice work and well presented. Only one point to add to your list - beasts and cavalry also cannot move to the upper levels of ruins. This includes tyranids hormagaunts and raveners, IG rough riders, chaos Khorne fleshhouds and so on. Also in the disembarking from transports, there is a very small spot that states, that if the vehicle has even pivotted, the guys cannot move or assault that turn. Now that was very fun when my opponent sprang that upon me in a tournament, when I was disembaking my CC jacked up BT command squad. Non rules related - One thing that I always overlook is that the BIG 5th rulebook contains a huge bobby section with swaths of info and pictures and is a great source of inspiration. Bikes and Jetbikes may not Turbo Boost through difficult terrain and must move at least 18"." Jetbikes move OVER difficult terrain, not through. So this does not apply in the strictest sense. If they are in the difficult terrain when they start moving, they cannot Turbo Boost, nor can they end such a move in that terrain. Those are the only times a Jetbike is considered to be moving in or through difficult terrain, as evidenced by the Dangerous terrain tests they are compelled to take at that time. Wrecked vehicles are left on the table and become pieces of terrain, counting as both difficult and dangerous terrain and providing cover.